Born in the United States, but raised in Spain and England, Kemiji is a graduate of the University of California at Davis. Apart from his Economics and Spanish Literature degrees, he also studied Viticulture and Oenology, eventually leading to his interest in wine and the formation of Miura Vineyards in 1995 and Candela Cellars in 1998 (sister value label to Miura showcasing promising younger vineyards), Almvs in 2000 (a Bordeaux blend - Cuvee Kemiji & Portay), Antigv²s in 2001, Acvs in 2003, and two projects in Spain – Arrels and Clos Pissarra. After a remarkable career as a Master Sommelier, Emmanuel Kemiji took his passion for wine to the vineyards in 1995, when he partnered with his college roommate Byron Kosuge to create the boutique Miura label. Miura is named after the most coveted and feared breed of fighting bull in Spain. The Miuri bottles are unique sporting an etched image of a red-eyed bull rather than a paper label. 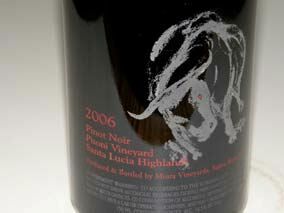 His Pisoni Vineyard Pinot Noir is a widely acclaimed cult wine. After launching Miura, Kemiji went on to collaborate with an unlikely group of winemakers, including Chef Laurent Manrique to create the Acvs label and its acclaimed Almus wines. The name Miura is derived from Don Eduardo Miura, the most famous breeder of Spanish fighting bulls and a name synonymous with nobility, boldness, and power. In 1989 Kemiji became the thirteenth American to pass the Master Sommelier exam in London, England, and one of only seven to date to pass on his first attempt. In the same year he was chosen “Sommelier of the Year” by the California Restaurant Writers Association while director of Wine & Spirits at The Ritz-Carlton in San Francisco. Kemiji was also chosen “Wine Director of the Year” in the Critics Choice Awards and was honored in the August 1999 issue of San Francisco Magazine. The San Francisco Chronicle named Kemiji as one of the “10 Winemakers to Watch for 2000.” He has also been a regular wine judge at the Los Angeles County Fair and the San Francisco International Wine Competition. Miura wines are difficult to locate but they are available in fine wine retail stores and on the internet. The style is big and bold, fruit-driven and lush. 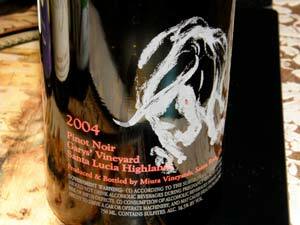 Miura has concentrated on Chardonnay, Merlot, and Pinot Noir. The bottlings are distinctive. They feature an abstract etching on the bottle of a bull with a red dot for an eye. Most of Miura’s small output is distributed to hotels and restaurants.